If you have markers, paper and a love for art, you are just as ready as AbiNoelle was to explore the online lessons offered by ArtAchieve. For the review, we were given full access for one year to the Entire Level One program. Now, creatures are all over the place, and even the grandparents have enjoyed displaying the results of the classes! 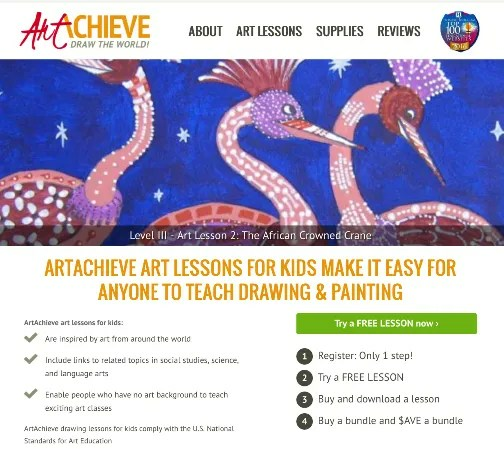 John Hofland, author of ArtAchieve, a teacher, world traveler, and homeschool dad has used his artistic and educational talents to create unique online lessons that are sure to encourage your child in their artistic pursuits, especially if they love colors and creatures! John’s travels around the world have expounded his vision to incorporate everyday studies into his art lessons. Each class includes a mini history lesson giving interesting details and facts surrounding the elements used in the drawing which could easily help to correlate other subject matter being taught within your school day. This structure is not only a creative aspect to art, but enhances and broadens each lesson from a mere drawing exercise to a complete educational experience. During our review, we explored all aspects of the program, including several additional free lessons offered; however, we mostly used the powerpoint slides to complete the majority of the projects. WOW! It’s truly amazing what a child can accomplish with precise instructions. By following the powerpoint presentation, AbiNoelle, as a kindergarten student, was able to follow the practice sheet instructions and duplicate each practice box quite successfully, which set the stage for drawing that lesson’s creature. She also enjoyed seeing the slides of various historical sites that supported that art lesson. After utilizing the practice sheets, she was then able to follow the simple steps for drawing the creature. The powerpoint presentation also gave clear examples of different coloring techniques. The vibrant colors in the illustrations served as a great inspiration and AbiNoelle enjoyed copying some of the effects and adding her own creative flare to each project. Below, you can see how she performed on the practice boxes, her final drawing of the Hungarian Insect from Lesson 3, and the colorful Gecko drawn from Lesson 4. In the LEVEL ONE online program, those interested can take advantage of two free lessons! After the freebies, eight other lessons are available for $4.00 each or you can choose to bundle the ENTIRE LEVEL ONE program for $30.00. Other smaller and larger package options are also available. John Hofland has developed five levels of art instruction. Each level has between eight and twelve lessons. What a fun program! Our daughter loves to draw and paint and John Hofland’s ArtAchieve built upon her desire and became a wonderful teaching tool. We look forward to continuing with the lessons throughout our summer break from regularly scheduled classes.